Elizabeth Fiedler's article Friday on Councilman Bill Greenlee's continued hold on the bike lane planned for 22nd St. included a critical point from MOTU's Andrew Stober that I hadn't seen reported elsewhere: 22nd St "cannot be legally marked for two car lanes because it is too narrow." Currently, the area in question between Spring Garden and Fairmount features a single extra-wide 22-foot travel lane that drivers treat informally as two lanes. Restriping the street with two narrow travel lanes would likely have some real traffic-calming benefits, as it would lower the operating speed. But that is not what Councilman Greenlee is calling for, and MOTU says the restriping would be illegal. When I spoke with Greenlee, he was very concerned that cars and buses would be able to move through the neighborhood fast enough during rush hour twice a day, but he didn't have much to say when I pointed out that 22nd Street would be left with an uncrowded 22-foot drive lane most of the time, making highway speeds feel comfortable when there aren't many cars on the road - like at night when car and bike collisions are more likely to be fatal. Lane width is an important determinant of the operating speed drivers feel comfortable traveling at, and speed makes all the difference in whether a collision is fatal. Can anything move this debate forward? Fortunately, it's possible to test Councilman Greenlee's assumptions about 22nd St traffic, and Streets Commissioner David Perri suggested to Inga Saffron that Streets could do a "trial run using traffic cones to mark the dividing line between cars and bikes." Saffron proposed a public meeting to get a broader range of feedback on the plan, but the Bicycle Coalition's Sarah Clark Stuart says that Greenlee has refused a public meeting request hosted by the Bicycle Coalition (officially an RCO) or the neighborhood association. Surveys were given to residents in June 2012 and January to gauge their opinions on this new addition to Fairmount Avenue. The results showed overwhelming support for the implementation of a bicycle lane ,which allowed the Bicycle Coalition to move forward with the proposal. The Fairmount Civic Association and the Bicycle Coalition distributed the June 2012 survey. Of the 375 respondents, 81 percent said they were strongly in favor of a bicycle lane. Only about 7 percent of residents strongly opposed its creation. 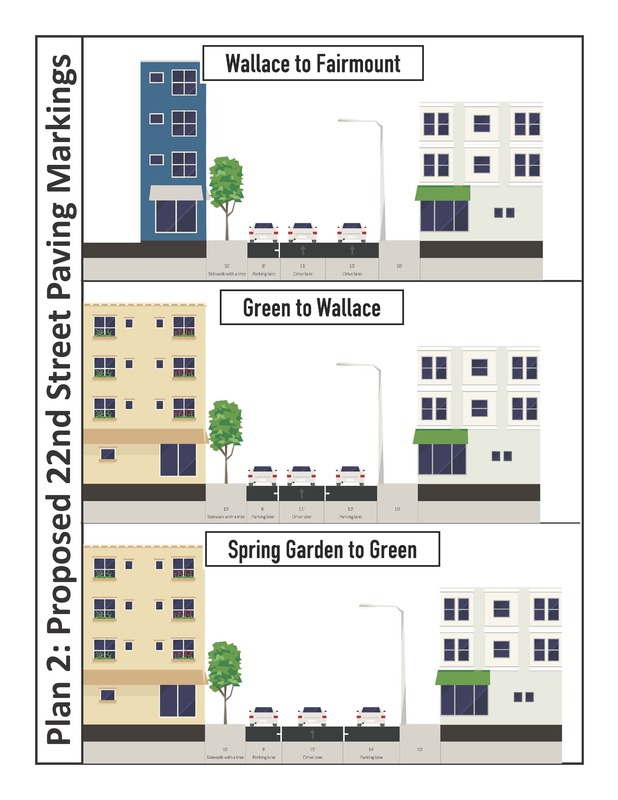 In the January survey distributed by the Francisville Neighborhood Development Corp. and the Spring Garden Civic Association, of 134 respondents nearly 70 percent were in favor and about 10 percent very much opposed to the bicycle lane. “The tones of questions were friendly and there was no sense of strong opposition,” Stuart said. Unless neighborhood sentiment has swung dramatically against bike lanes in the last two years, it seems likely that broadening the conversation by involving the neighborhood associations would leave opponents of the 22nd St. bike lane in a weaker political position.